Sometimes I think I spent my entire youth in front of the television set. My fondest memories as a kid were spent engrossed in the adventures of Starblazers, Voltron, and Battle of the Planets. The ultimate irony was that for all of these shows that kids were insane for, there were hardly any toys on the market. No Child World store had the Phoenix from Battle of the Planets. Pretty much all of those shows have shaped what I collect today. 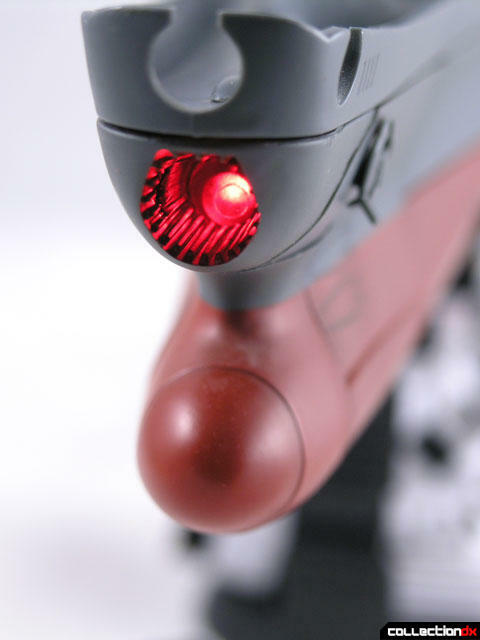 Collectors now have their choice of the nice diecast Godphoenix from UniFive, the Masterpiece Voltron from Toynami and the toy I am talking about today, Bandai’s Big Scale Soul of Popynica Space Battleship Yamato. I’m spoiled now, for sure. 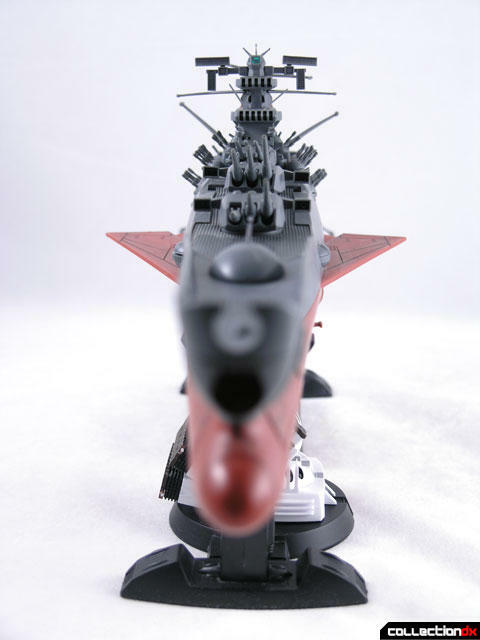 But back in the day, I had no Yamato (Or Argo, as it was called in Starblazers). I was teased every day by the images of Starblazers toys on the commercial for Mr. Bigs Toyland. I actually found a piece of wood in the forest behind our apartment that somewhat looked like the Argo. Yeah, I painted that and flew it around the yard. I was Ghetto. 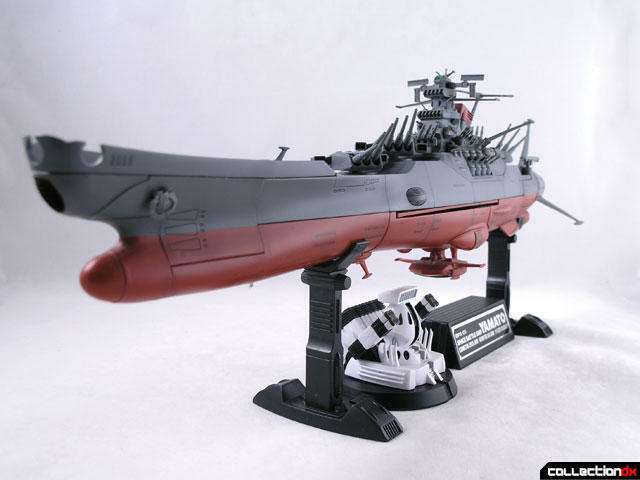 When Bandai announced that they were making a SOP Yamato I went nuts. This was back in 2001, when I was really hesitant about spending top dollar on toys. 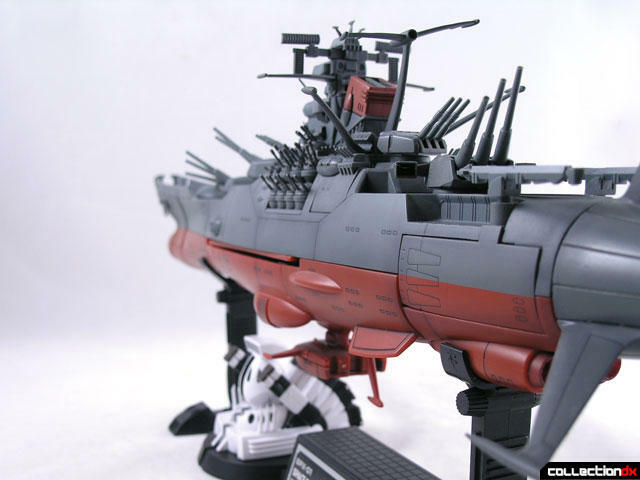 The thought of a diecast Yamato, all tricked out, made me tremble with excitement. And then the facts came out. Mostly plastic, ¥20,790 pricetag. Damn, out of my reach. They sold out quickly despite the warm reviews, and prices on the secondary market climbed through the roof. I remember seeing them for as much as $400 at one time. On my trip to Tokyo in 2003, I didn’t find ONE for sale anywhere. Fortunately my good friend Dave offered to sell me his – it was missing a small part on the back, but it was cheaper than retail so I grabbed it. Of course, shortly after that Bandai re-released it and prices on the secondary market went down. Years later, is it worth it? 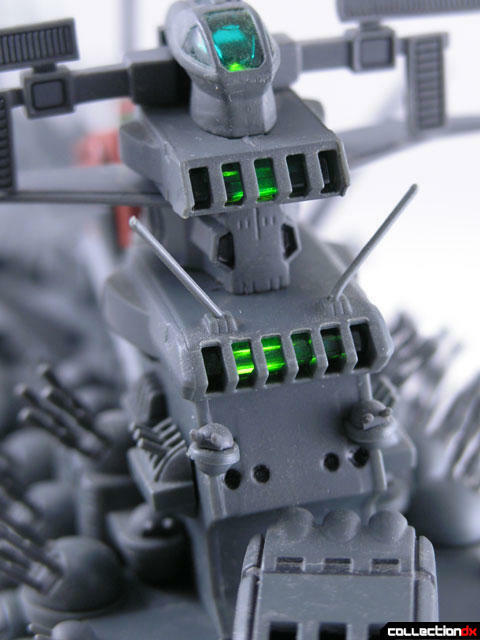 The Big Scale SOP Yamato is an interesting piece. As a display model it is excellent. Full of detail and grandeur. But as a toy, not so much. 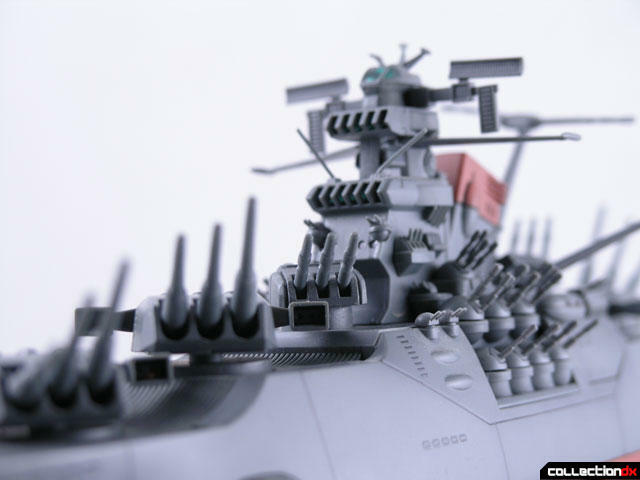 The Yamato is loaded with gimmicks and action features. At about 17 inches long, it is a lot of ship. Unfortunately, most of the ship is plastic, with diecast being reserved for a section around the bridge and the rear cone of the engine. The toy requires 2xAAA batteries which will give you about 40 minutes of play time. All of these sound and lights are demonstrated in our video review. Bandai really outdid itself with some of the action features. There really is a lot going on with this piece. The turrets on the deck each have moveable barrels and by turning a dial on the side, all three cannons move together. The base parts of the cannons are metal. 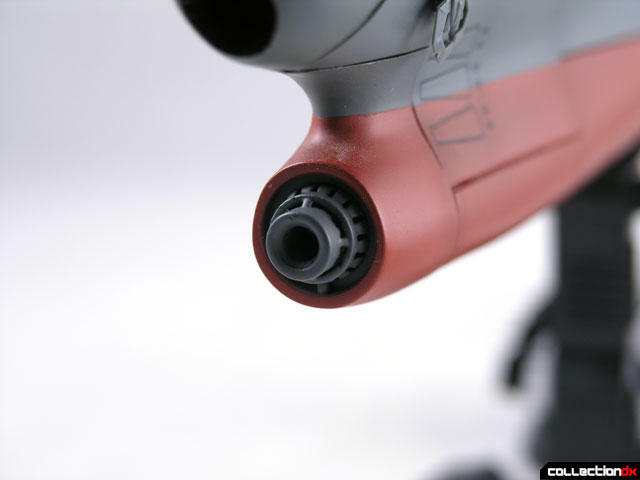 On the right side of the bow of the Yamato is a door that opens to reveal the inner mechanisms of the Wave Motion Gun. This door pops open by pushing in a button on the other side. 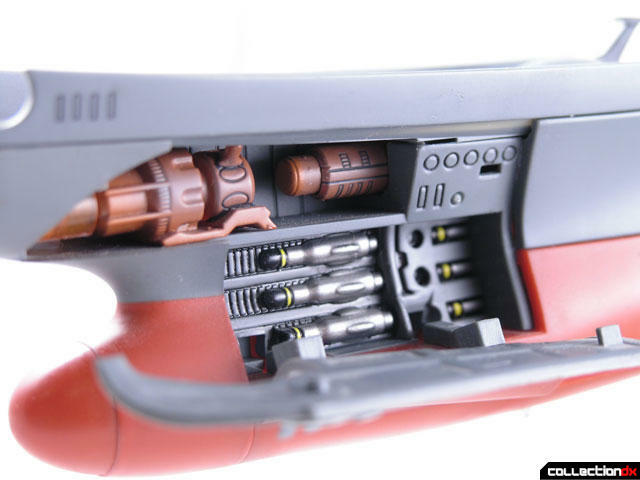 By sliding a part on the deck the bolt can slide in to engage the engine. The rear of the Yamato features a similar action. Pull down on the long horizontal track on the left to open the door, pull down on the right one to activate a spinning gear in the engine. Located midway on the ship is a set of spring-loaded wings. Press a button and out they pop. I found I really have to push mine back in to get them to stay locked in. The chimney behind the bridge houses a secret set of missiles. Slide up the oval part on the right side to lift the missiles out of the chimney. 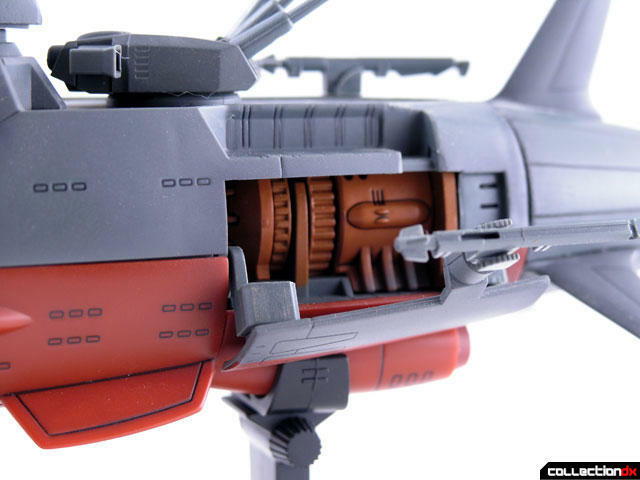 The small cone at the ships bow is removable to reveal the ships radar, as seen in Space Battleship Yamato 2. Underneath the Yamato is the third bridge – this features an opening door for ground landings. 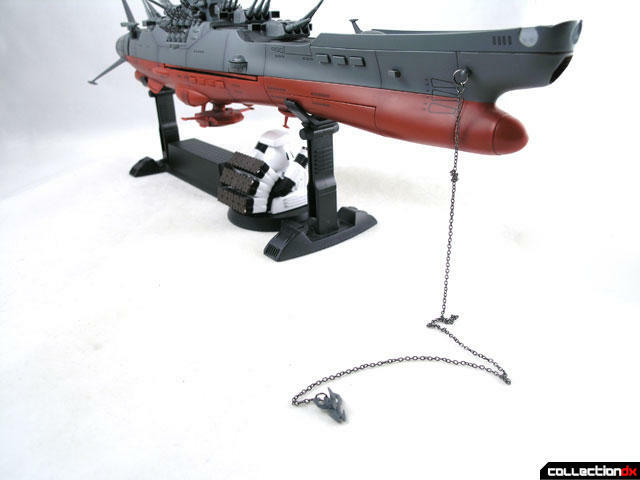 The anchor on the front of the Yamato can be replaced with the Rocket Anchor, which features a real metal chain. 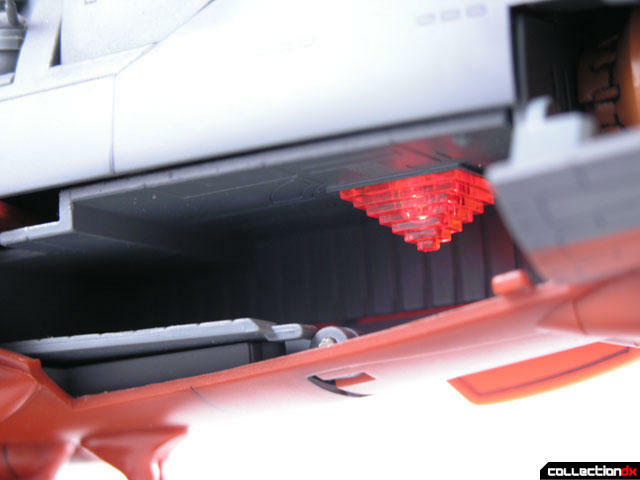 The Yamato features a rear hatch that can open to accommodate the included fighters. The side door of the landing bay also opens to reveal the bay lights. 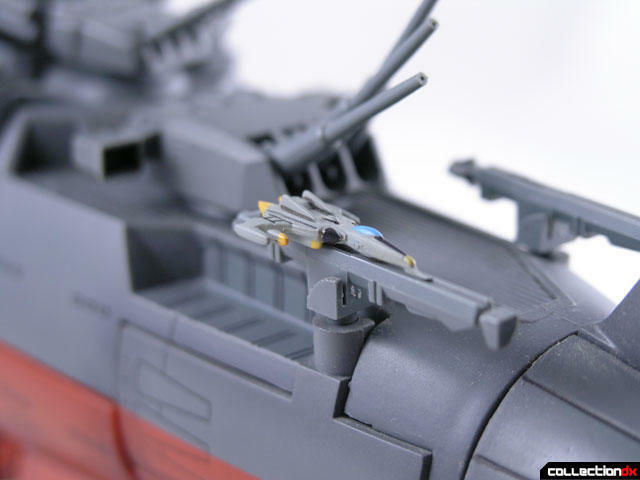 In addition to the Yamato itself, the set also includes several support ships. The Cosmo Tiger 2 can be stowed on a small platform that opens behind the small guns on the left side of the ship. The whole reason the Yamato traveled to Iscandar was to go get the Cosmo Cleaner D – the machine that will clean the radiation from Earth. Yamato included the Cosmo Cleaner D as a model kit that you have to assemble. It’s pre painted, so all you have to do is put it together. 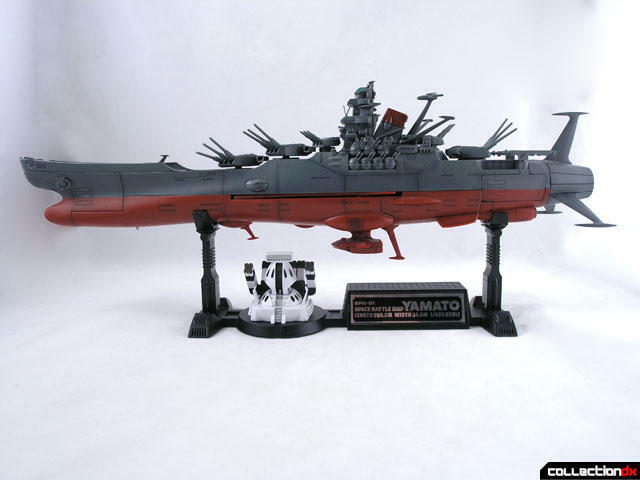 The Yamato features a black stand that can hold the Yamato, Cosmo Cleaner D and all support ships. One would think that all of these things would add up to a great toy. I mean, If I had a toy that did all of these things when I was a kid, I would have been in heaven. Unfortunately I would have destroyed it in 2 seconds. This thing is FRAGILE. There are spiny bits all over the bridge that seem to flick off without warning, never to be seen again. The small spines on the captain’s quarters just seem to vanish into thin air. Some of the parts on the rear of the bridge aren’t secured properly, and the fins around the engine don’t secure tightly at all. Also there are a few issues with the implementation of some of the gimmicks. Pushing the button on the side to pop out the panel on the front doesn’t really work, it just nudges it out a bit, and then you have to get something sharp to pry it open. 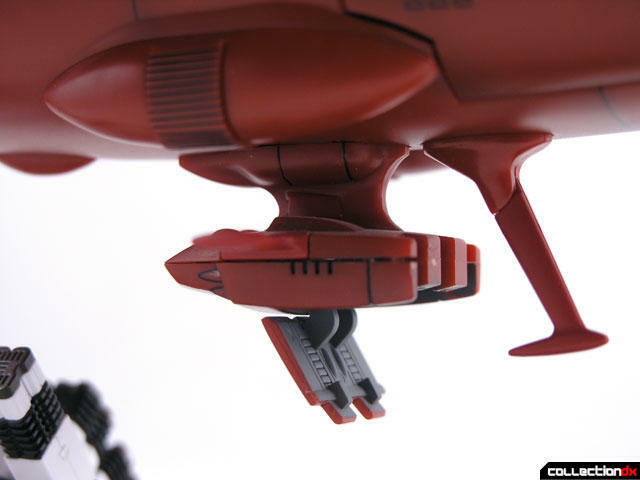 The wings pop open easily, but you really have to push in past its opening to get them to lock closed. And then there is the lack of metal. Granted, the toy does have some heft, but it feels so plasticky. At over $200, you would think the thing would be largely made out of metal. Don’t get me wrong, I like it a lot – it’s a fantastic looking rendition of the Yamato, It is just not what I was looking for. I want something I can zoom around the room and hand to my kids. This is not that toy. This is something you have in an executive office that gets dusted by the “help” once a week. It may be big scale but it is hardly “Popynica”. Your enjoyment will depend on what you want to get out of this thing. 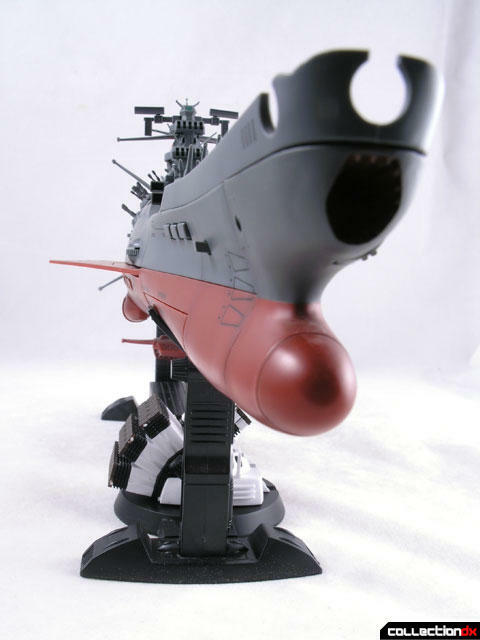 I like it as a display model, but I am still waiting for a great Yamato “Toy” that won’t hurt my wallet. 17 inch... wow, that one big toy. I remember seeing this one on a Soul of Chogoukin book. I always like the design, too bad the cost and the size make me rethinking about buying this. Looks like I have to settle for a smaller ship. Taito put out a soft vinyl yamato that is about $20 us that seems about the same size. It might be what you are looking for. I bought this toy last year when they re-released it. I don't think I paid over $200. I felt the same way; the tiny pieces are a pain, and it is NOT meant to be played with. But overall, I still love it, although I am afraid to even touch it. I saw the Taito one locally. I saw the Taito one locally. It's a great piece you can "swoosh" around without fear of losing $50 in parts as they fall off into the abyss. It's out of production - these Taito things are usually one run wonders - but I saw it last night 01-30-08. If you want it, I can try to grab it for you. I saw that Raideen they did too Josh. They're doing a nice big Cosmo too. It reminds me of the Thunderbirds stuff they did a few years back. I got the TB2 they made and it's a great toy without the price of the Aoshima or the craziness of the Takara releases. As a lucky accident it's scale to the Konami gashapon of the pod vehicles. 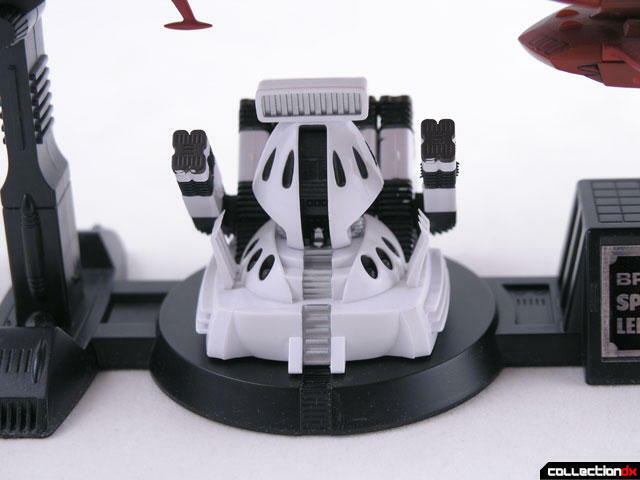 I've got the taito one coming to me, as well as captain harlock's arcadia, the trains from galaxy expres 999 and the blimp from queen esmereldas.. all for under $20 each, all from taito. Crazy. I've got the color and black raideen, reviews coming soon. for the price you cant go wrong. Where'd you nab the Taito Yamato? I'm not really sure what's up, but there has been a TON of Yamato love around lately. And I share that love. thanks for the review. 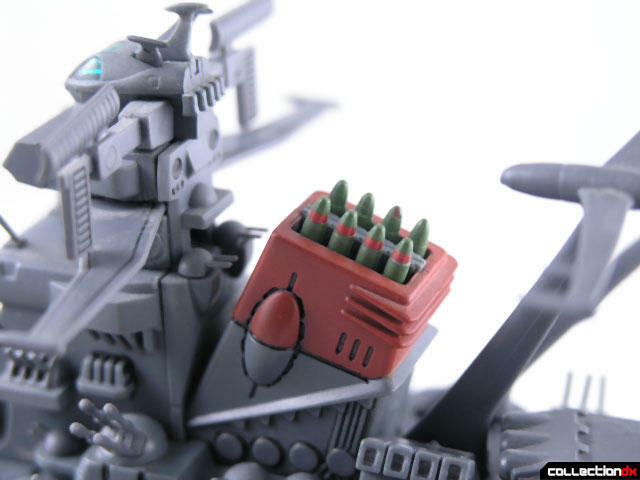 I've been really hopiung to get one of these, and while I appreciate the "unplayability" of this, I'd LOVE to have it on my desk, activating cannons and sending Cosmo Tigers on sortie.